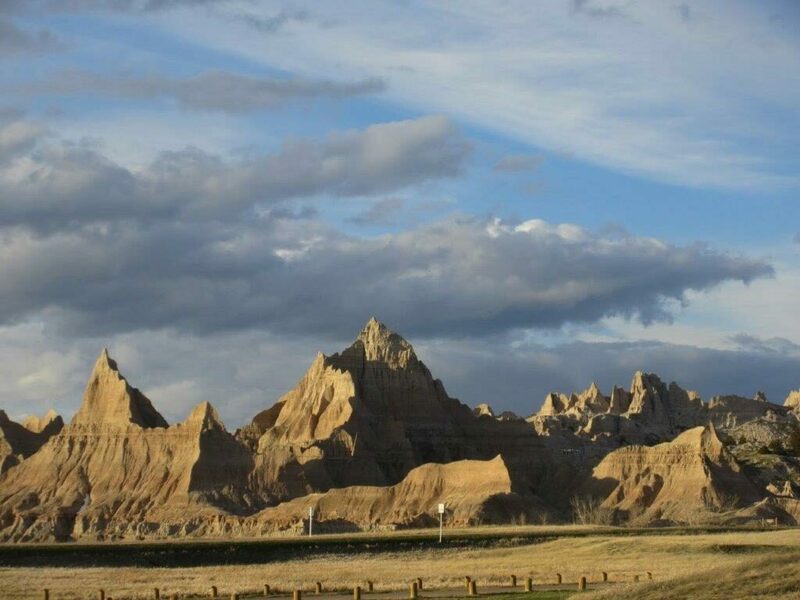 From the Badlands we drove to the Black Hills and visited the Mt. 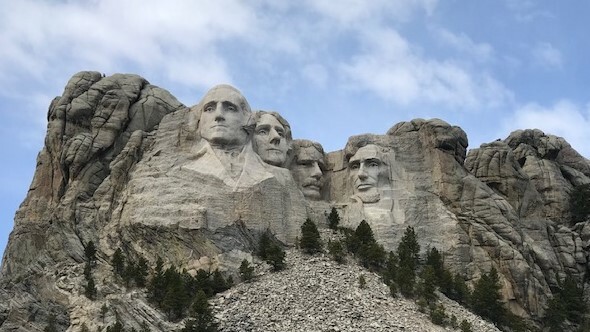 Rushmore National Memorial (#50) (https://www.nps.gov/moru). We took the conventional photos of the presidents with blue sky and white clouds in the background. We checked out the exhibits on the history of the memorial and its master sculptor, Gutzon Borglum, and were on our way after a 90-minute stop. 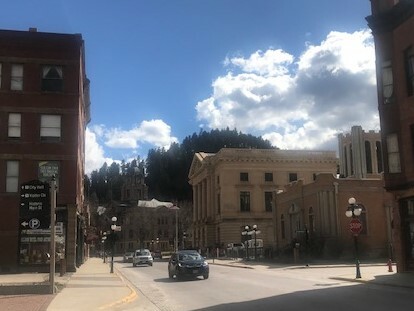 We headed north through the Black Hills and stopped at the historic mining town of Deadwood, getting not only a taste of that town, but some “canned on the spot” beer from the “Sick and Twisted” microbrewery to take to our friends in Billings. 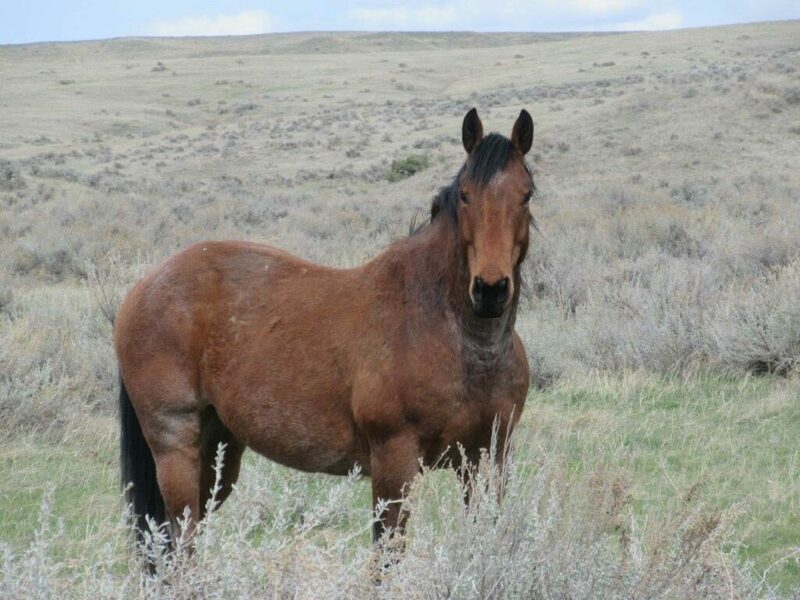 We then traveled west into Wyoming and stopped at Keyhole State Park near Devil’s Tower. 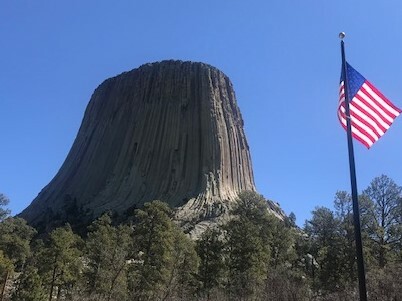 In the morning it was a 30-minute drive to get to Devil’s Tower National Monument (#51) (https://www.nps.gov/deto), the first National Monument in the US, created by President Teddy Roosevelt in 1906. 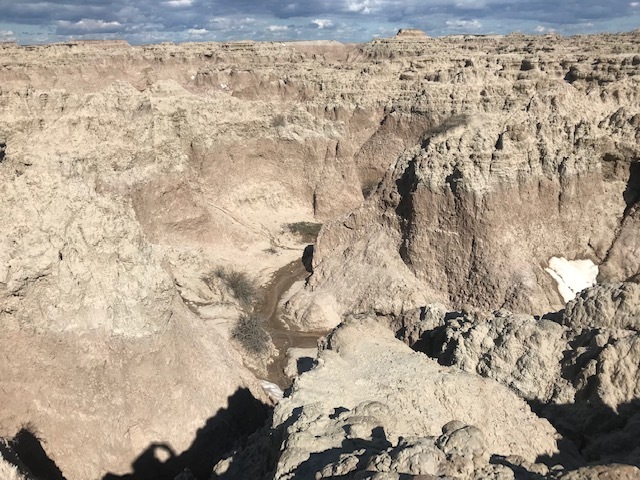 The weather was delightful; a sunny, but not too hot day and an easy one-hour walk around the Tower We watched some climbers making their way up this world-renowned climbing challenge and tried in vain to see the falcons that roost on the upper reaches. 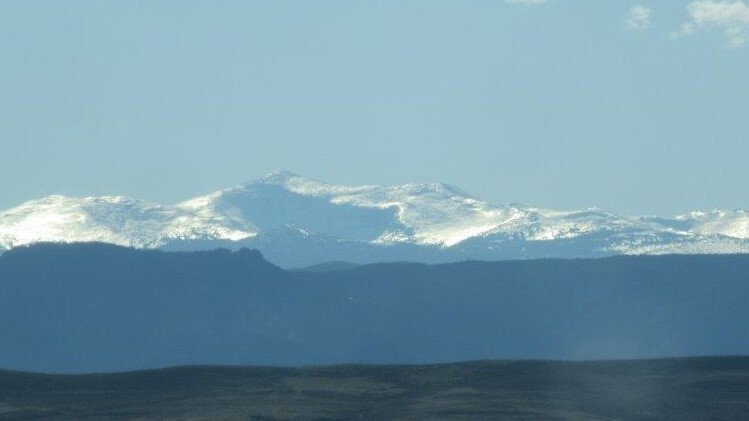 After a picnic lunch near the Belle Fourche river, we jumped back on I-90 and really felt that we entered “the west” when we saw the snow-covered Big Horn mountains 50 miles to the west of us. We spent the night in Sheridan, Wyoming, once again nearly alone at an RV park. 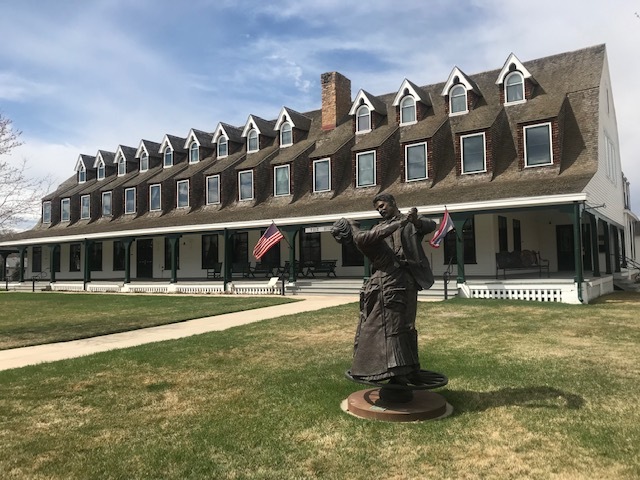 In the morning we took a few minutes to visit the Sheridan Inn (National Historic Landmark) and then drove north into Montana and stopped at the Little Bighorn Battlefield National Monument (#52) (https://www.nps.gov/libi), where Custer and most of his 7th Cavalry met their demise at the hands of the Lakotas and Cheyennes. Having seen the Washita National Battlefield in Oklahoma earlier on this trip (where Custer massacred the Southern Cheyenne Peace Chief Black Kettle and much of his tribe) this was a fitting “bookend.” We drove on to Billings, Montana, where we enjoyed a meal out and sleep in a real bed with our friends David and Mary Lee Darby. We headed north along the Missouri River and crossed it at Atchison, Kansas. 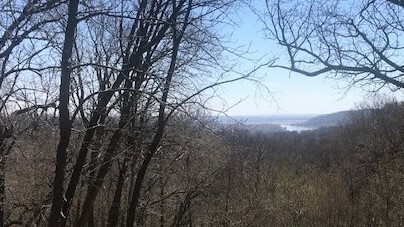 Then continued north on the west side of the river to have lunch at Nebraska’s Indian Cave State Park, which offered a nice view of the Missouri from high bluffs on the west side. Kansas is the third state we have traveled through without setting foot on the ground (the others were Florida and Illinois). 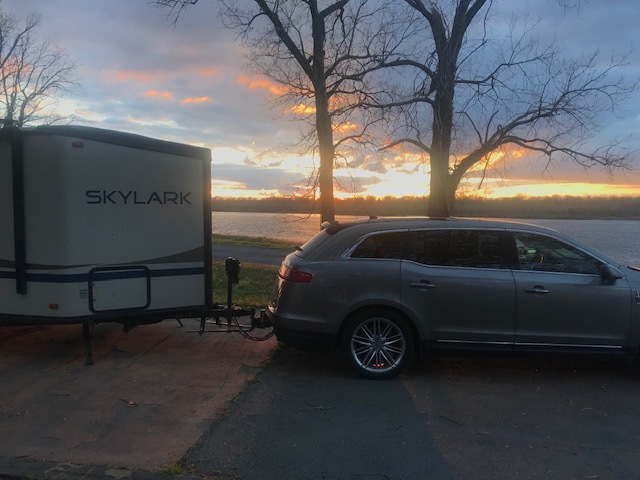 We had planned to also route ourselves through Iowa to pick up one more state sticker for the map on the back of the Skylark trailer, but the flood damage from the storms several weeks ago resulted in closing many of the river crossings. 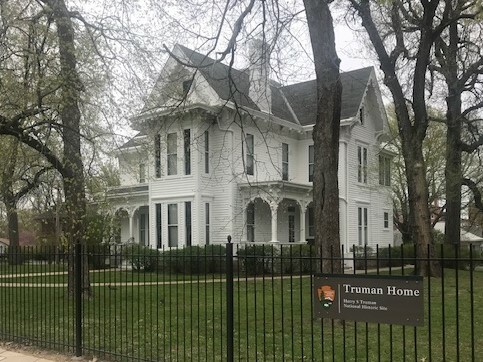 In Lincoln, Cynthia visited the Quilt Study Center and Museum (#46) (www.quiltstudy.org) at the University of Nebraska, while Larry did some grocery shopping. We spent the night at a Nebraska State Park (Branched Oak) on reservoir north of Lincoln. The sun was out and temperature above 70 degrees, so we enjoyed some afternoon time reading and got the grill out to cook some hamburgers. We have not had many days that we can enjoy outside grilling. We saw many pelicans wheeling around above the lake, and heard that there were also sandhill cranes in the area, but didn’t see any of them. They are their northward migration to Alaska and other points north, where we saw them in late summer a couple of years ago. 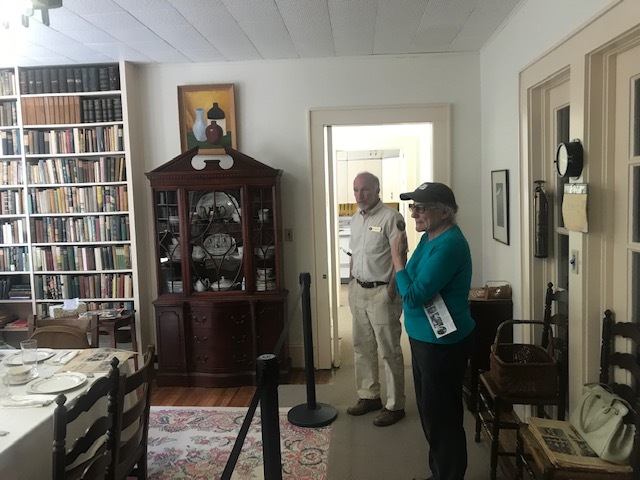 We headed west to Grand Island, and there stopped at the Stuhr Museum of the Prairie Pioneer (#47) (www.stuhrmuseum.org), a well-endowed county museum with displays on life on the prairie in the 1880-1920 period. As a bonus, they had a large display of art from all the area middle and high schools. 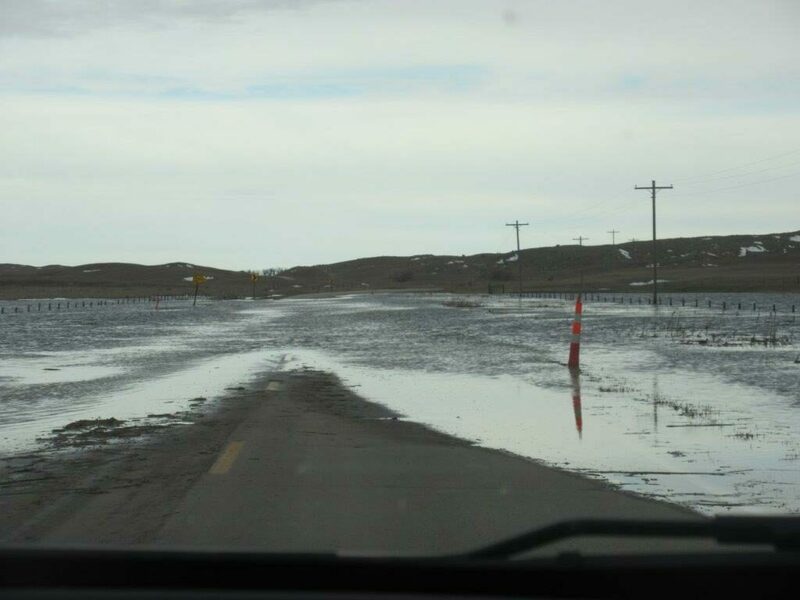 Further travel towards northwest Nebraska was off the interstate. 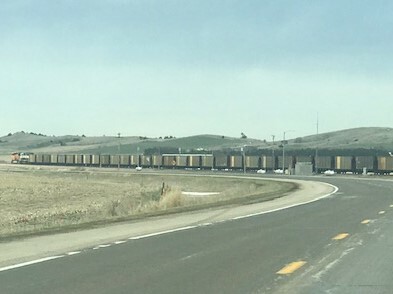 Our route took us along a main corrider for the BNSF railroad and we saw coal trains about every 15 minutes, full ones heading east and empty ones heading west, presumably to coal mines in Wyoming. 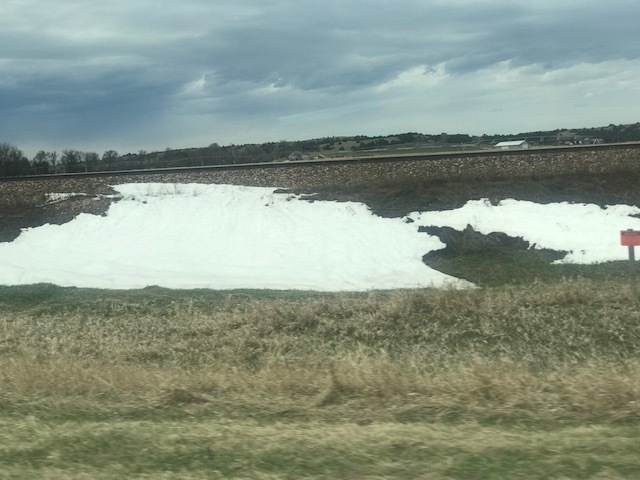 Despite traveling in 77 degree temperatures, there was a lot of snow in areas where it had drifted in the “Bomb Cyclone” of the previous week. 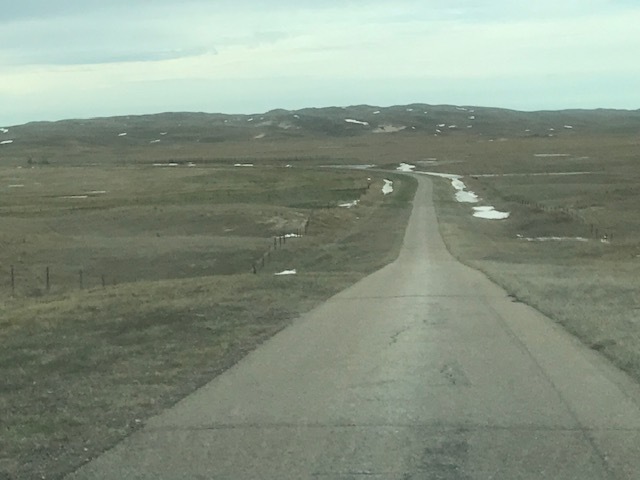 We were gradually climbed through the “Sandhills” of northern Nebraska. These are sandunes created about 10,000 years ago when it was drier here, but which have since been stabilized with grass and some trees. It is these sandhills for which the sandhill cranes are named. To get to our campground we traveled on one-lane county roads and encountered one spot where the meltwater covered the road, which we passed through with some trepidation. See video of that here: https://youtu.be/kvxT7XS04LU. 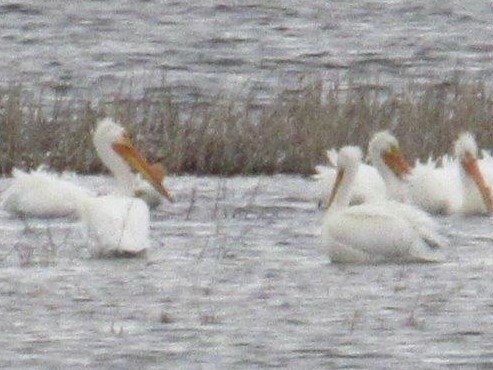 We saw numerous pelicans on the snow fed ponds. We didn’t try to get to the lakeside campsites at the state park because the access road was muddy and rutted but we were able to stay near the entrance and were completely alone at this campground. 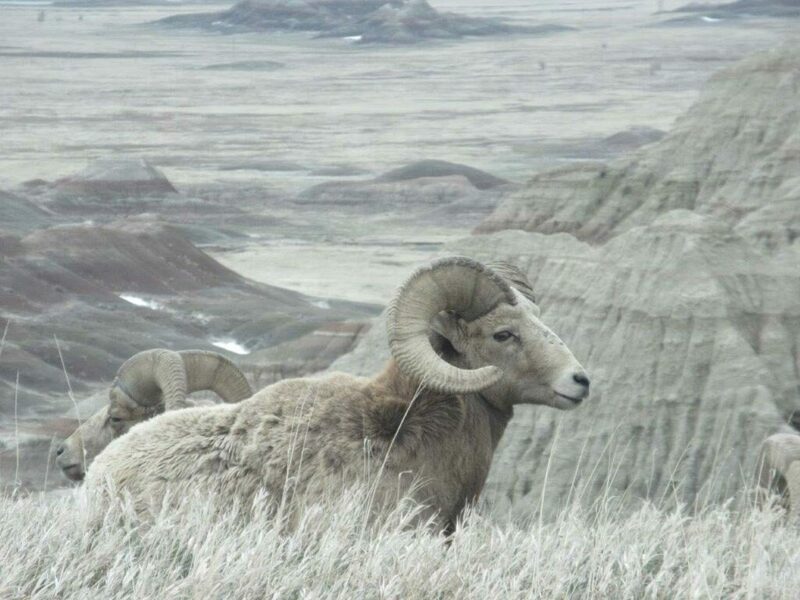 We continued on “lonely roads” north and bit west on Tuesday (4/16) as we made our way through the Samuel McKelvie National Forest (with almost no trees), entered South Dakota and crossed the Pine Ridge Indian Reservation to the Badlands National Park (#48) (https://www.nps.gov/badl). We managed a brief visit to the Visitor Center and then set up our trailer at the campground near the entrance, with only one other party in the 100-site campground. We enjoyed a dramatic thunder and lightening storm late that night. But it was done by morning. 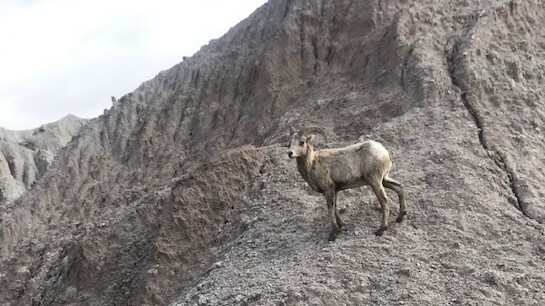 On Wednesday (4/17) we set out on a tour of the park, which features badly eroded sediments with many fossils of mammals and sea creatures. It was very windy, but we did manage to do four short hikes to view the scenery, including many herds of sheep. To complete the “loop road” we went out to Wall, South Dakota. 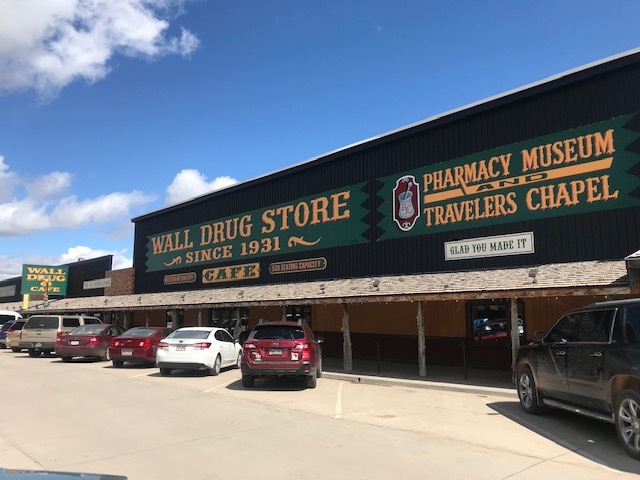 Anyone who has driven on Interstate 90 in South Dakota knows about “Wall Drug” which has an about a thousand advertising billboards along the route and is now the economic powerhouse of this small town. So, we had lunch there just to take in the scene (Wall Drug now covers about the same area as a large Walmart, but lots of “kitsch” for merchandise and housed in wooden structures with wooden detailing). The café has many western artists on display. 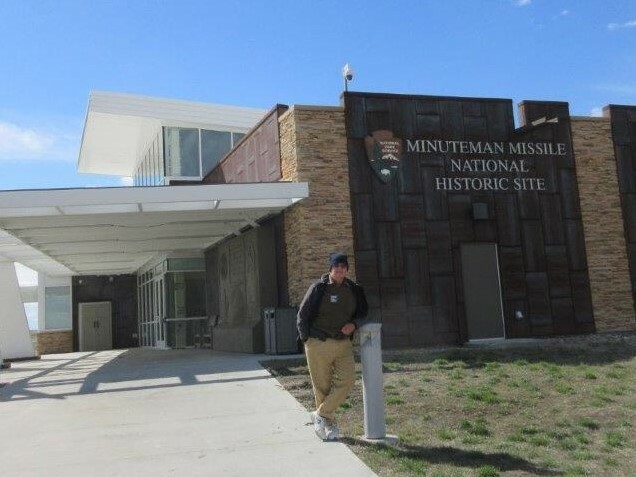 As we returned to the Badlands, we also stopped at the Minuteman Missile National Historical Site (#49) (https://www.nps.gov/mimi). We visited one of the missile launch sites and the Visitor Center which explains the history leading to the development of the solid-fueled ballistic missiles and their partial dismantling after Reagan and Gorbachav agreed to the Strategic Arms Reduction Treaty (START) in 1994. 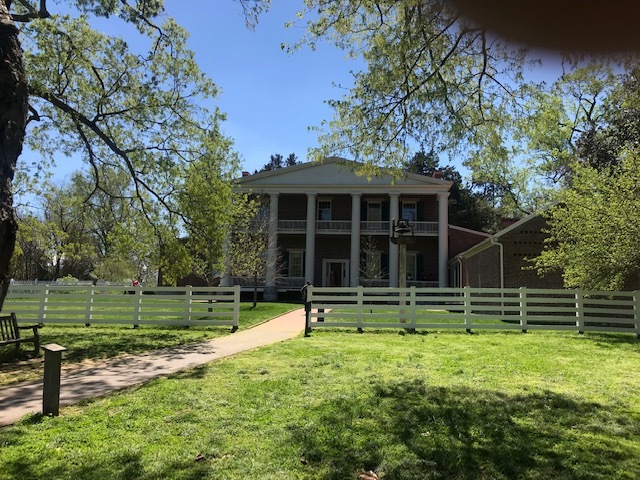 Our last stop in Kentucky was at the John James Audubon State Park in Henderson (#42) (https://parks.ky.gov/parks/recreationparks/john-james/), where there is a great museum that documents his life, even though only a small portion was spent in this town. 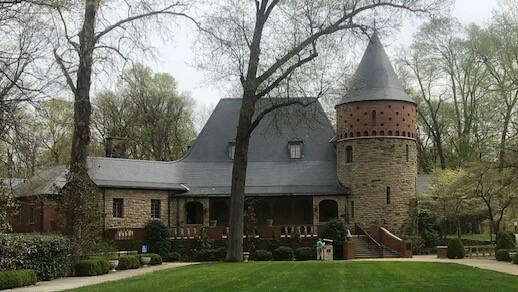 The museum itself was built by the WPA in the depression and mimics a French chateau (Audubon was born in Haiti and spent his youth in France after the slave uprising in Haiti, later moving to the U.S. to avoid being drafted in the Napoleonic wars). 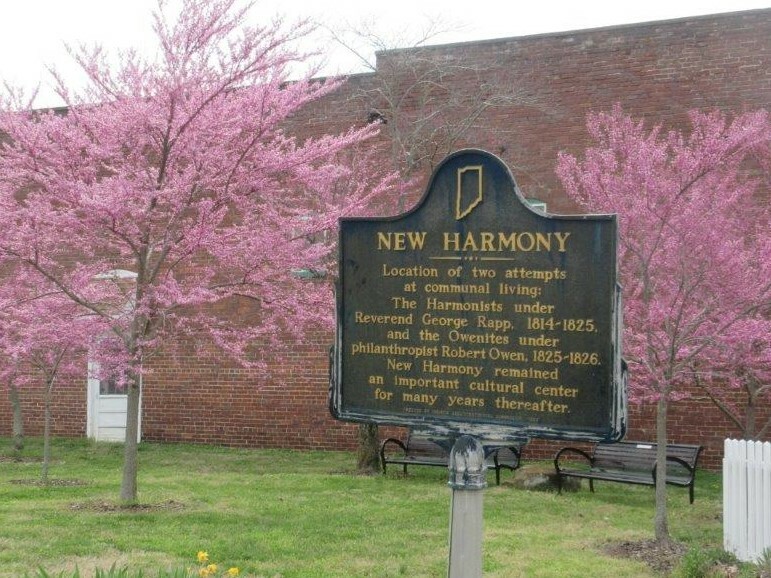 We then crossed the Ohio river into Indiana at Evansville and then proceeded west to the Wabash river (border with Illinois) for lunch in New Harmony, Indiana, a national historic landmark (#43) (https://newharmony-in.gov/). It was settled in 1814 and was first a spiritual sanctuary for the Harmonie Society and then a haven for international scientists and scholars led by Robert Owen in 1825. 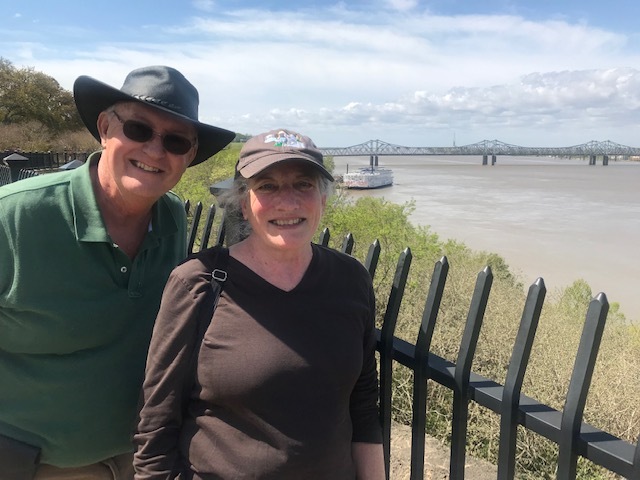 We sped across Illinois and wound up for the night (April 11) in St. Charles, Missouri, which is on the Missouri river just a bit above where it joins the Mississippi near St. Louis. This town was settled by French Canadians in 1769, when the territory was still under Spanish ownership. 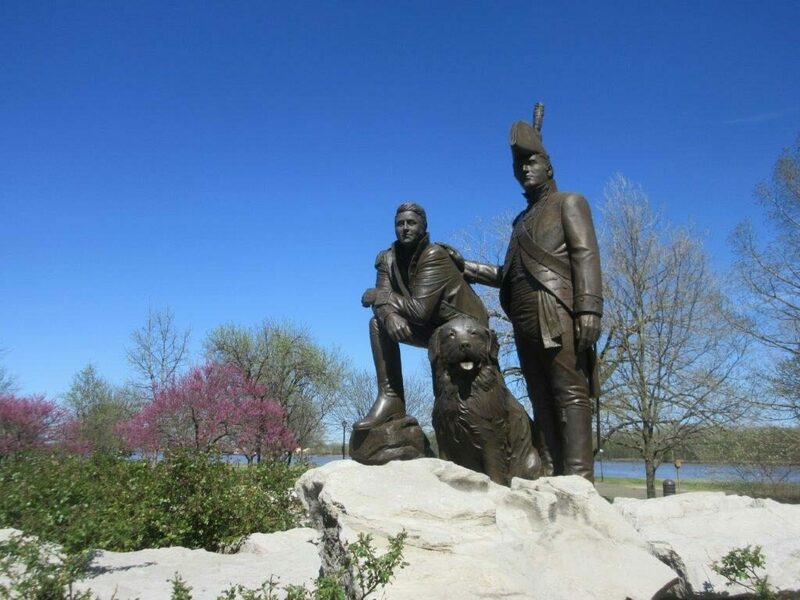 In 1804, it was the site of the departure of the Lewis and Clark Expedition on their way west to the Pacific, and it also served at the first Missouri State Capital from 1821-1826. Seeing as we visited Cape Disappointment at the mouth of the Columbia in Washington State in January, it was a nice connection to see where they effectively started their westward journey. 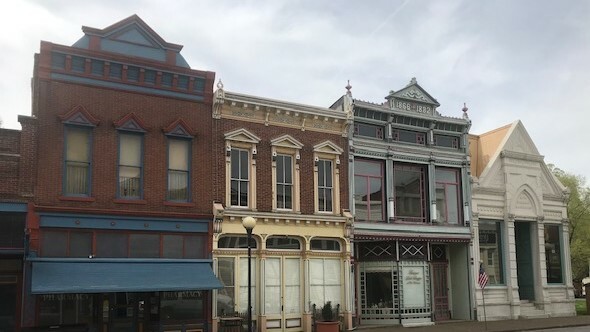 It is a charming river front town that has well-preserved old buildings and many tourist-friendly restaurants and shops for all those things you don’t need but can’t resist buying. More importantly the St. Louis Water Color society was hosting an exhibit at the Missouri Artist on Main Gallery (#44) (https://maomgallery.com/), which we took in along with the Foundry Art Centre (http://www.foundryartcentre.org/), where we attended an evening opening for a ceramics exhibit. 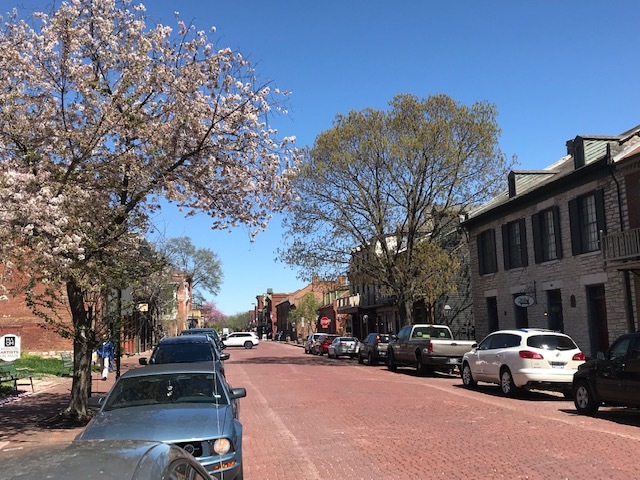 We spent two nights in St Charles, which gave Larry a chance also to take the Lincoln for an oil change as we have now gone over 5000 miles since leaving Olympia. Many Germans settled in the lower Missouri valley and they brought with them not only a penchant and skill for brewing beer (think Annhauser-Busch), but also wine-making traditions. 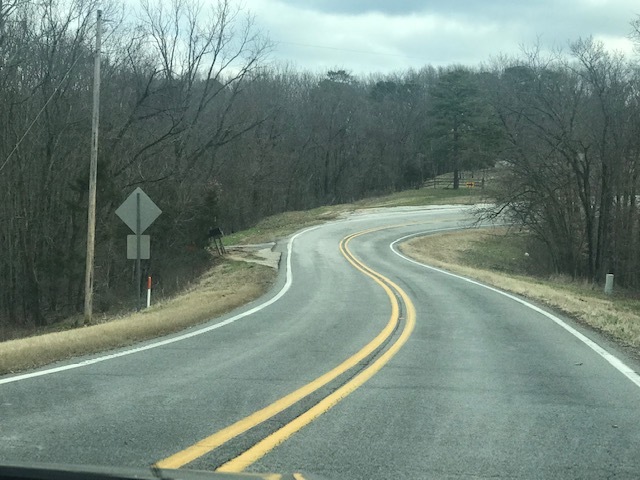 We decided to leave the freeway on our way west and stopped at the town of Herman on the “wine country trail” and are bringing back a few bottles of Missouri wine. Traveling west towards Nashville on April 8 was the most miserable driving we encountered so far. The rain was steady and sometimes torrential and gusty winds adding to the difficulty of driving, even though we were mostly on Interstates. 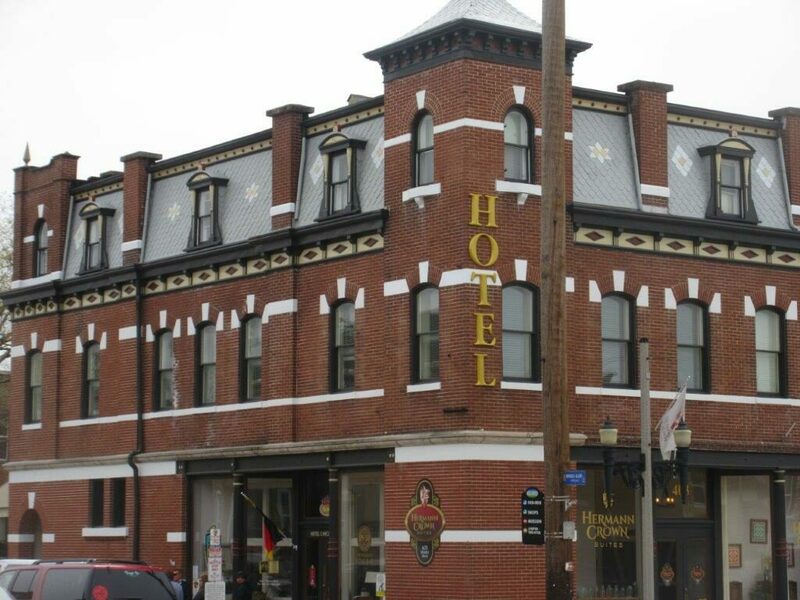 However the weather cleared as we got to Nashville and because of an early start and the shift back to Central from Eastern time we arrived just a bit after noon. We left the trailer at an RV dealer to replace the tongue jack that had been disabled when the trailer came off earlier in Georgia. We went to downtown Nashville and had lunch at the Ryman Theater, the original home of the Grand Ole Opry, which is now housed in a giant complex on the edge of the city. 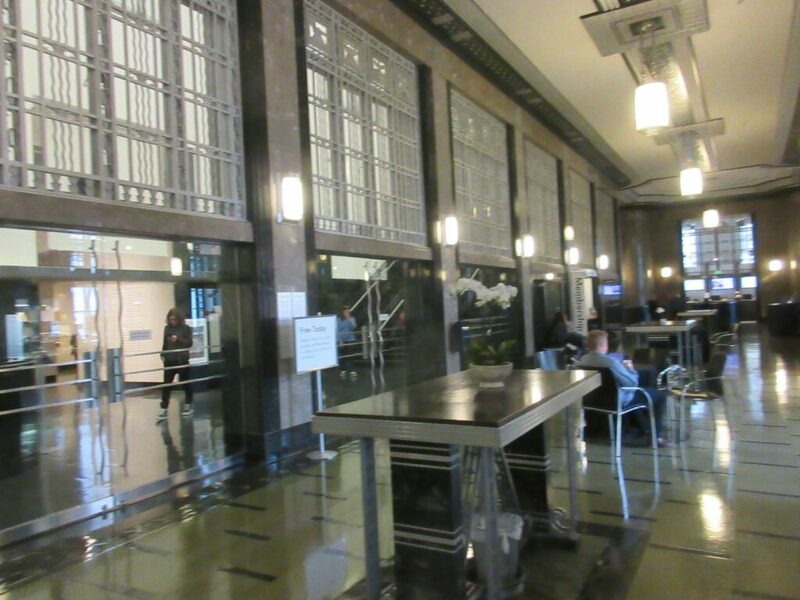 We got our minor country music fix in a honky tonk bar, but spent most of the afternoon at the Frist Art Museum (#38) (https://fristartmuseum.org/), which had a major exhibit of French Impressionistic artists from the Mellon collection in their Art Deco former U.S. Post Office Building. There was also an exhibit of the photos of Dorothea Lange, who documented the conditions of the poor in the Depression. In the evening we enjoyed the hot tub at the KOA campground, the first time we have been able to do that on this trip. 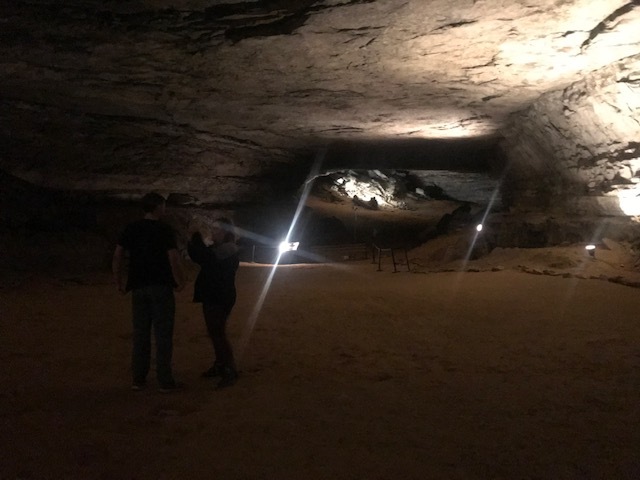 Although we had planned to spend a second night in Nashville, we instead headed north to Mammoth Cave National Park (#40) (https://www.nps.gov/maca), the largest cave system in the world. Larry went on one of the shorter cave tours, while Cynthia enjoyed a walk in the sunshine above. 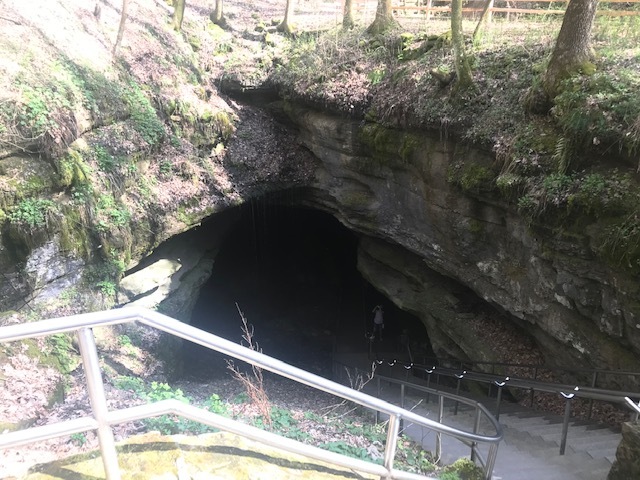 An interesting aspect of the Mammoth Cave System (and others in the area) is that they are fed by the Kentucky “Sinkhole Plain” in which the surface is dotted with many sinkholes where water percolates down into the cave system. We enjoyed staying at the National Park campground at Mammoth, as there were only five other campers in the 100-site campground. A warm, pleasant evening with the stars and the new moon along with gentle evening sounds of crickets and frogs were a nice accompaniment to our campfire, the first one we have managed on this trip. 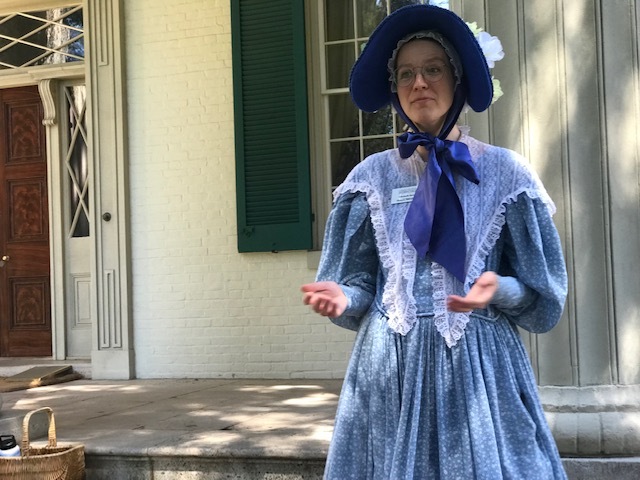 In the morning, we headed north for a brief visit to Abraham Lincoln’s Birthplace National Historic Park (#41) (https://www.nps.gov/abli) near Hodgdon, KY. We visited the memorial containing his “symbolic” cabin (not definitely the one he was born in, but similar) and the “sinking spring” which provided them a constant source of water. 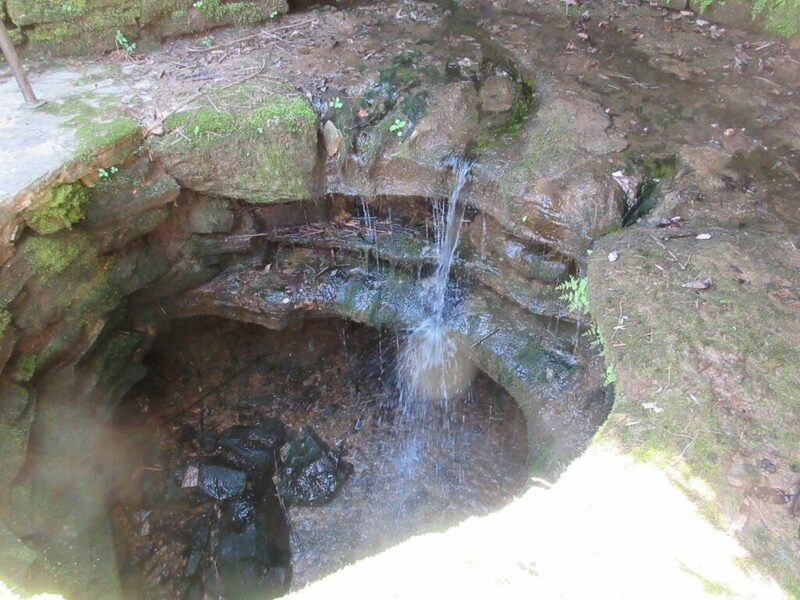 This is another example of a sinkhole in this area. After that short visit we resumed heading west and ended our day near Henderson, KY on the Ohio River. We encountered our most serious mishap as we were departing the state park in the morning. We were just a couple of miles down a curvy rural road when we heard (and felt) a big clunk and scraping noise. We stopped as quickly as possible, although in spot with poor visibility. It turned out that the pin holding the hitch into the receiver had failed and the hitch came off the car, dragging on the ground while the trailer stayed connected because of the safety chains. Cynthia positioned herself to warn traffic while I worked to solve the problem. We had several other come by to help. It wasn’t so bad in the end as I was able to raise the trailer tongue using the tongue jack, I had a spare pin and soon we had everything put back together and were on our way. However, the power tongue jack (which was installed new at the beginning of this trip) now works in only one direction, as it got slightly “crunched” against the back end of the car. Fortunately, I can work the jack manually. We entered South Carolina and had lunch with family friend in Greenville. We toured the lovely downtown of this city that is growing robustly with the automotive industry that has developed there. 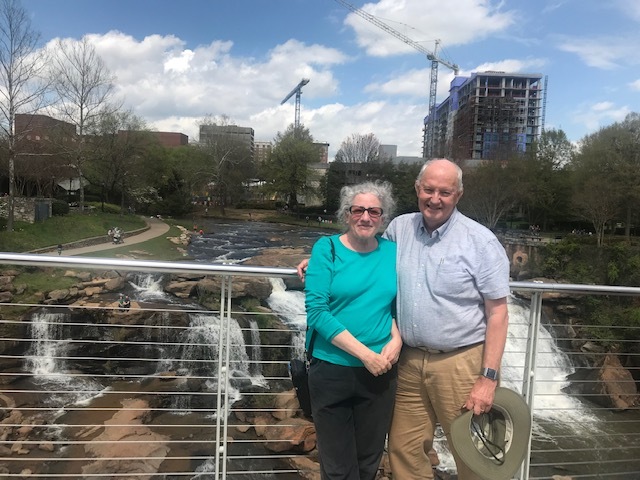 The Reedy river slows over cascades in the center of town and everyone was out to enjoy the spring day. 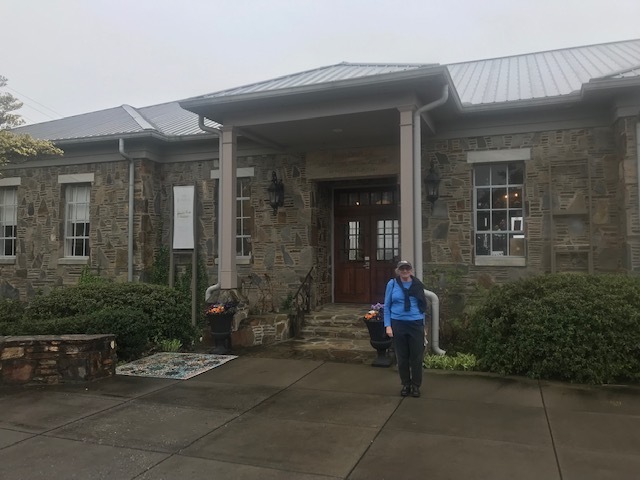 We then traveled to Flat Rock, North Carolina, and visited the home of Carl Sandburg (#36) (SSS), which is also a National Historical Site. We toured his house and learned about the record-breaking goats his wife raised there. 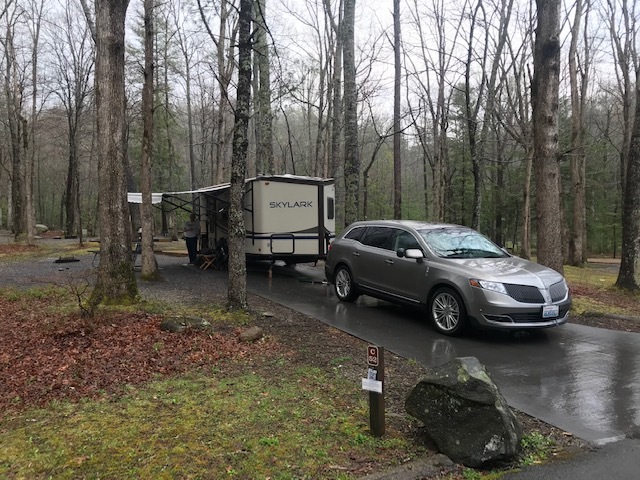 We wound up the day by entering Great Smoky National Park and “dry camping” (no water, electricity or sewer hookups) for the first time on this trip. The Great Smoky National Park (#37) (https://www.nps.gov/grsm) is the most visited National Park in the country, with more than 11 million visitors last year. 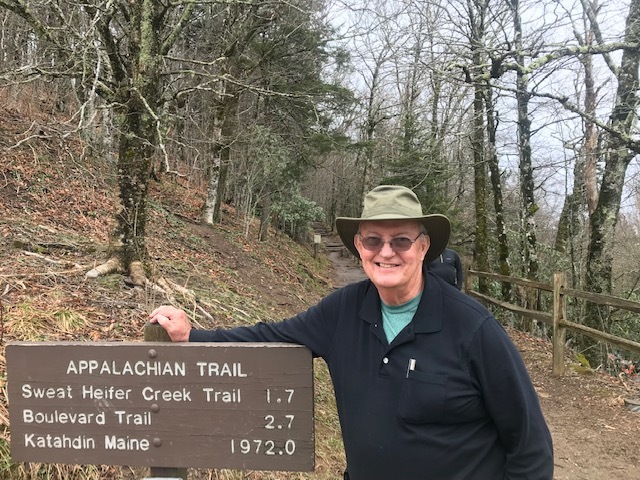 Even though this is not peak season, we encountered plenty of traffic as we ventured westward over Newfound Gap, over 5,000 feet to the Tennessee side of the park. 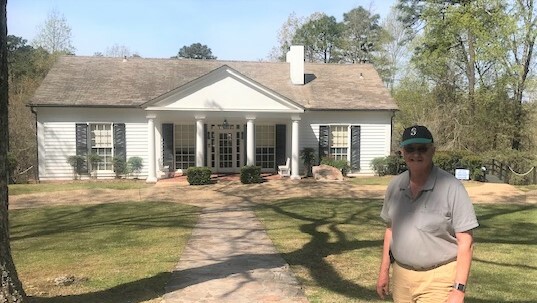 After entering Georgia, we diverted off the Interstate to Warm Springs to visit the “Little White House” (# 31) (https://gastateparks.org/LittleWhiteHouse) which Franklin D. Roosevelt used throughout his time as President to relieve his polio symptoms. Cynthia had been here before with sister Kim, so it was a bit of a memory trip for her. 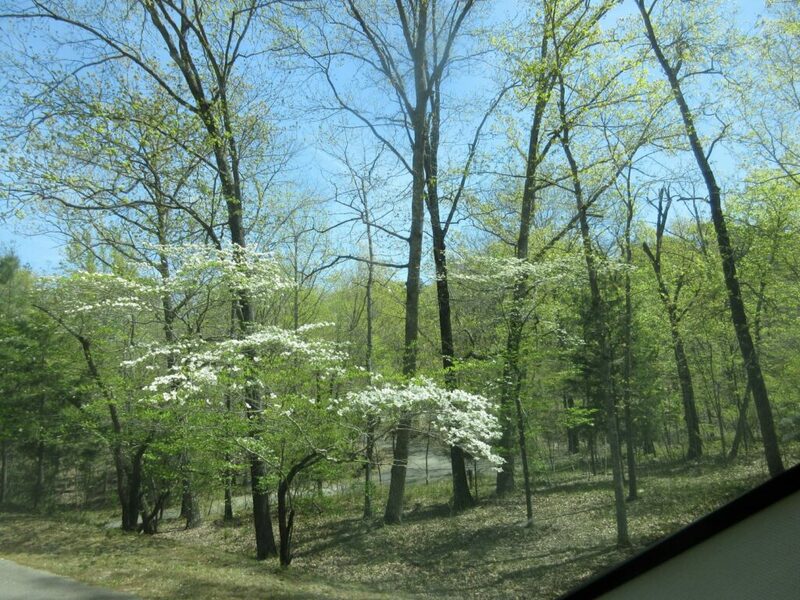 We enjoyed the fact that the Dogwood and other flowering shrubs were at a their peak. In Atlanta, we once again took a break from the trailer and stayed at a hotel. In the evening we were able to go to dinner our “honorary nephew” Colin and his Fiance Jordan at very hip neighborhood restaurant where our favorite dish was flatbread with pepperoni butter…yumm! After making a brief visit at the Jimmy Carter Center (#33) (www.cartercenter.org) Cynthia did an extensive tour of the High Museum or art (#34) (https://www.high.org), where she saw lots of great southern folk, African-American and continental African art. Larry, meanwhile, went to the hotel to do laundry and take a nap. April 5 was a short day, driving into rural northern Georgia. 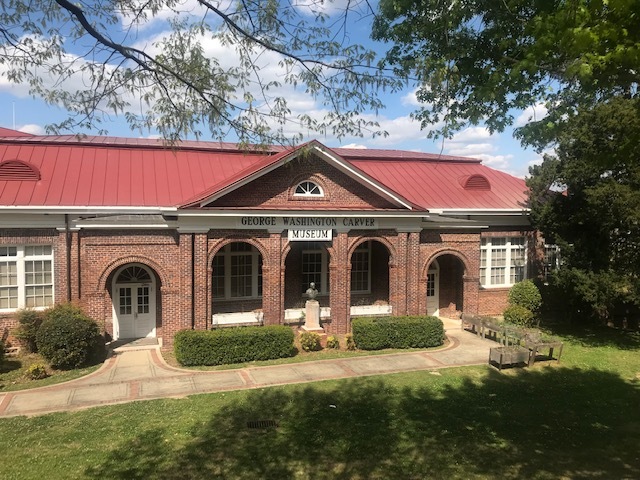 We stopped at Dawsonville to see a small art exhibit at the Bowen Center for the Arts (#35) (https://www.bowenarts.org) in a former schoolhouse, the “Old Rock School.” We spent the night at Unicoi State Park near Helen, GA.
We headed for Selma and Montgomery next. 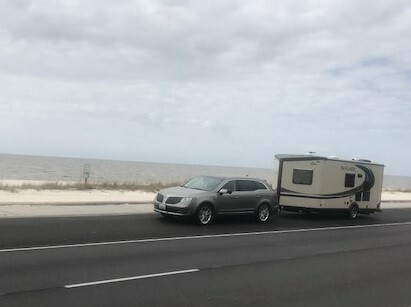 We traveled a bit off the Interstate into the extreme Northwest Corner of Florida for the sole reason that our Jayco Skylark trailer would earn the right to apply that state sticker to a map in the back that shows all the states in which it has traveled. 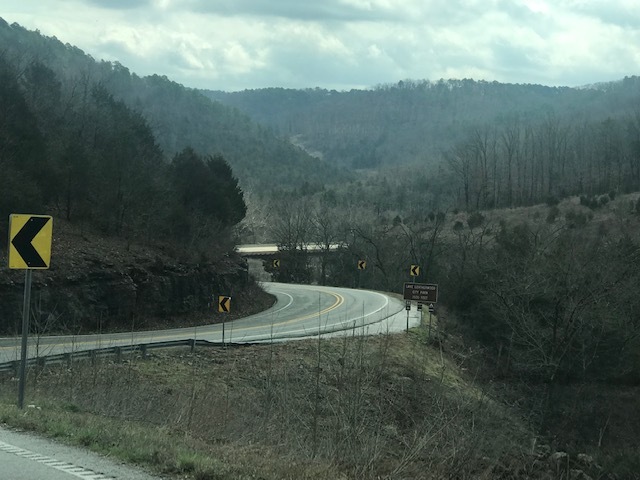 It was one of the most difficult drives as we headed up I-65. 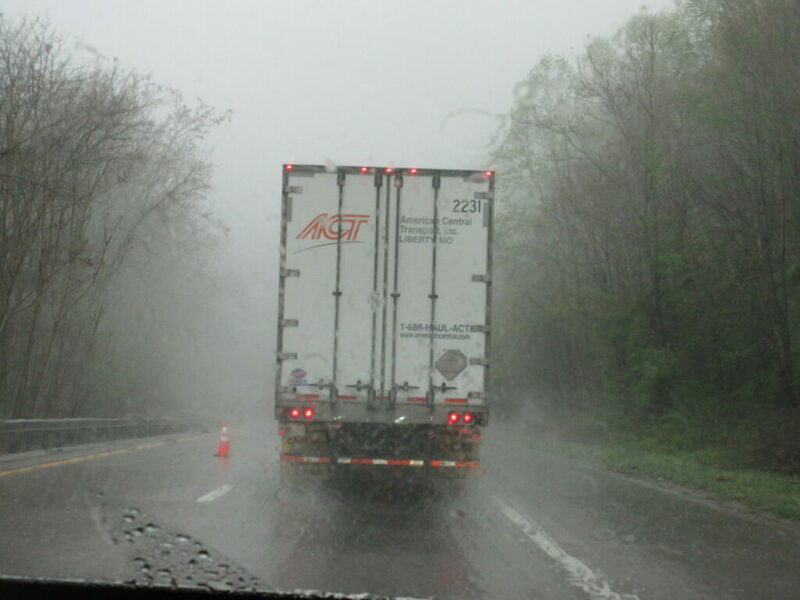 The weather was cloudy and occasionally rainy and the interstate (two lanes in each direction) was clogged with trucks and cars. That’s why we love to get off the interstate when we can, but it wasn’t feasible that day. Our main stop for the day was at the Montgomery County Museum of Fine Arts (#26) (https://mmfa.org), where there was an amazing ceramics exhibit and enough other art to keep Cynthia occupied for two hours during which time Larry had a little nap. We found a place to stay for two nights at another Corps of Engineers Campground, this time on the reservoir on the Alabama River. 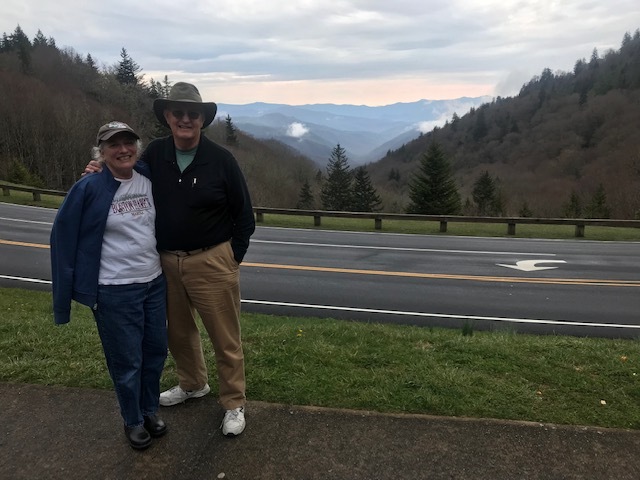 We have grown fond of these COE sites, because, like other facilities we can stay cheap ($13/night) on our Government “Senior Pass,” but unlike National Park service sites, these come with full hookups of water, electricity and sewer connections. 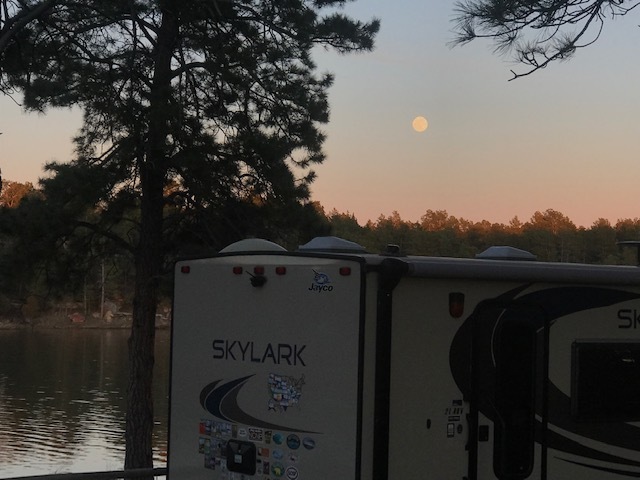 We are way from the freeway and urban hub-bub and enjoying the tranquility of the riparian environment, the stillness broken only by the occasional hoot of an owl, the squirrels chirping and occasionally an RV door closing. 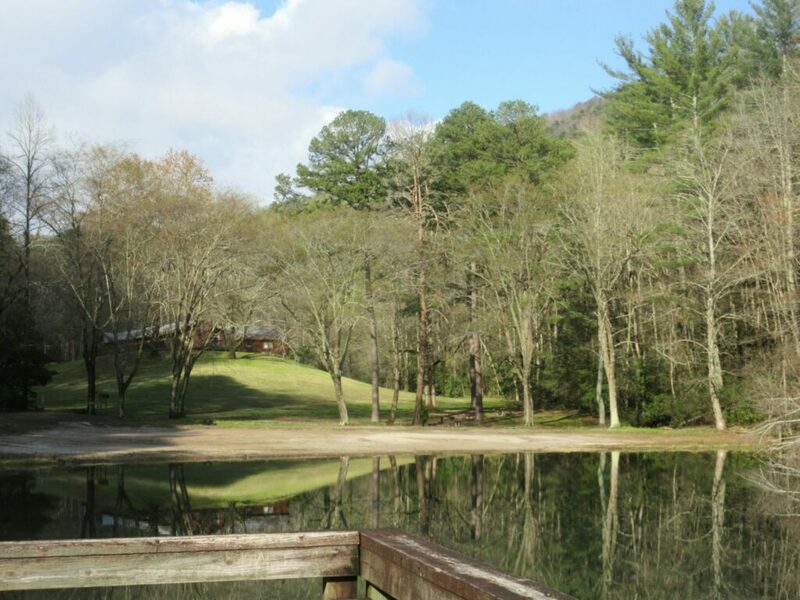 Most campers are old folks like us, so there are not raucous parties going on. We went 42 miles to Selma on April 1. There we visited the National Park Civil Rights Trail Visitor Center (#27) (www.nps.gov/semo), where we saw the events of early 1965 in which black residents of Dallas County were attempting to get registered to vote, but were being rebuffed by white officials. 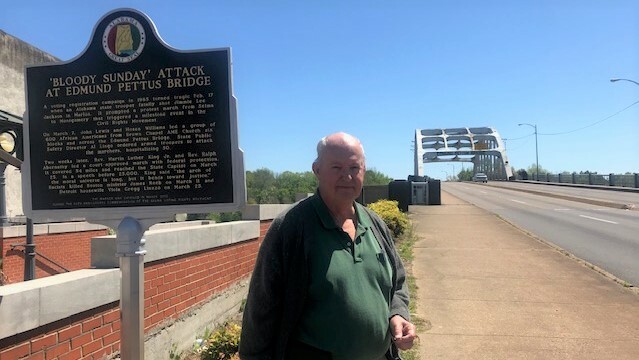 After one of the blacks was killed in the process, there was an attempt to march from Selma to the state capital in Montgomery that resulted in the “Bloody Sunday” on the Edmund Pettis bridge, in which many protestors were beaten by police with billy clubs. The national attention of this and the subsequent successful march to Montgomery helped lead to the passage of the Voting Rights Act of 1965. We also visited the Lowndes visitor center where there was a tent city in support of the marchers (one of three on the way to Montgomery). We drove on into Montgomery on April 2 and visited the Rosa Parks Museum (#28) (www.troy.edu/rosaparks). Rosa Parks refusal to relinquish her seat resulted in her arrest in 1955, 10 years before the Selma to Montgomery march referred to above. The museum had a fascinating exhibit which re-enacts the events of her refusal and the subsequent year-long bus boycott, which ended when the U.S. Supreme Court ruled in her case that the bus system could not be segregated. 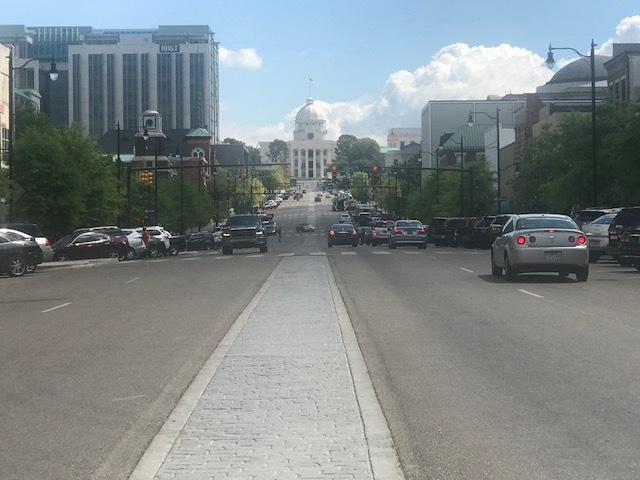 We enjoyed walking up towards the State Capitol on a beautiful day to briefly view the Dexter Avenue Church were Martin Luther King preached before moving to Atlanta. 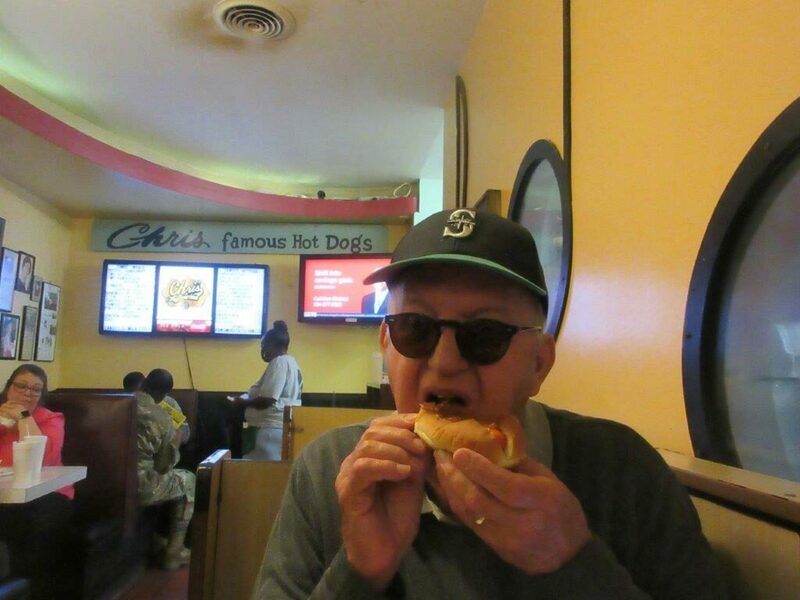 Lunch was at “Chris’s Hot Dogs,” a more than 100 year-old hot dog stand that is now designated as an historical site. 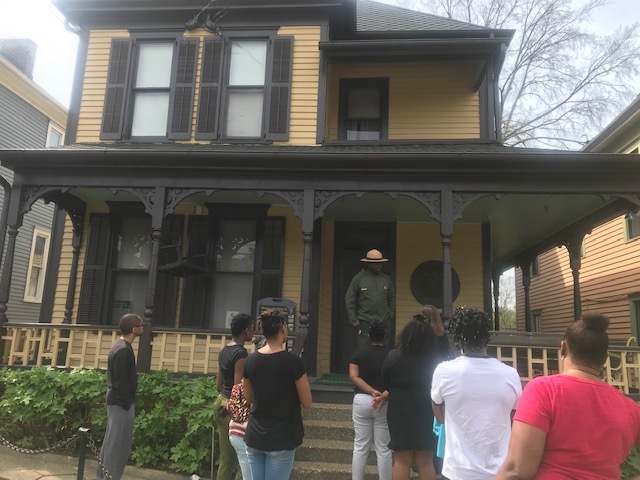 We finished our day by stopping in Tuskegee to visit the Tuskegee Institute National Historic Site (#29) (https://www.nps.gov/tuin) where we toured the George Washington Carver Museum and learned about Booker T. Washington, who founded the Tuskegee Institute (now University) and all of Carver’s many accomplishments, including that as an artist. 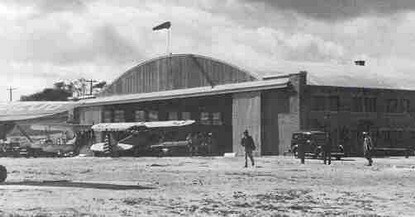 Tuskegee is also famous as the training site of the Tuskegee Airmen, the first African American pilots in World War II (#30) (https://www.nps.gov/tuai), so we explored the preserved hangers at Moton Field to absorb more of their story. We toured Vicksburg and its National Military Park (#22) (www.nps.gov/vick) on the Mississippi River. 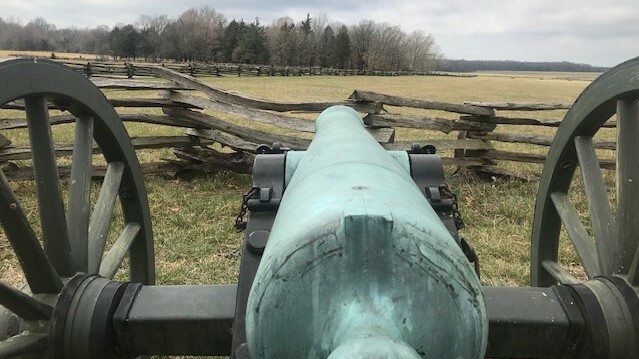 This was the site of two-month siege by General Grant that finally succeeded on July 4, 1863, about the same time that the Union held back the Confederate Forces at Gettysburg. We have visited Gettysburg before and this scene was similar, with many monuments to the various Union and Confederate forces arrayed against each other. The countryside is extremely hilly and green, and with all the tranquility it is hard to imagine all the devastation that was underway 150 years ago. We especially enjoyed the exhibit of the U.S.S. Cairo, one of several gunboats the Union forces used on the Mississippi River. It was sunk by running into a mine on the Yazoo River near Vicksburg. It was salvaged in the 1960s and now, with some reconstruction, is the best example of this kind of riverboat that exists. 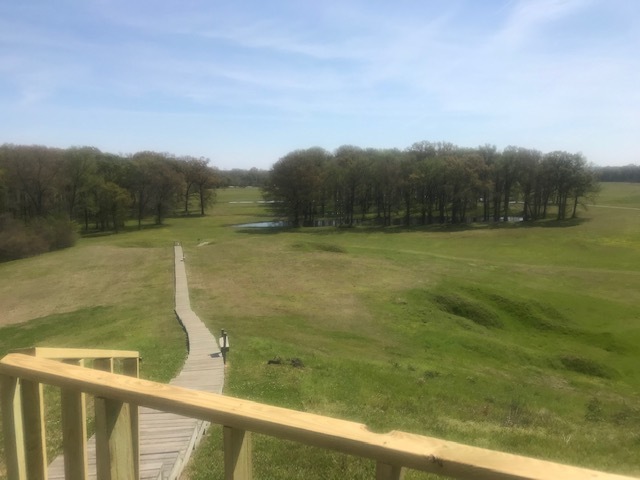 On Thursday we stayed in Louisiana and went to the Poverty Point Archaeological site (#23) (http://www.povertypoint.us/). This is a World Heritage Site, as it is one of the largest “mound-building” sites in North America. There were several thousand people here in the period 1700 BC to 700 AD. 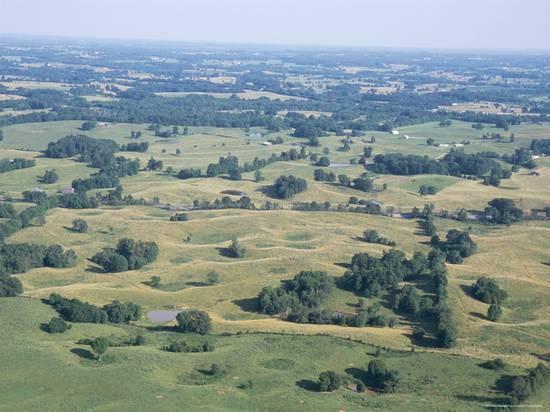 In addition to six large mounds, they built six half-circle arcs, where they lived. Archaeological exploration is ongoing at this site. 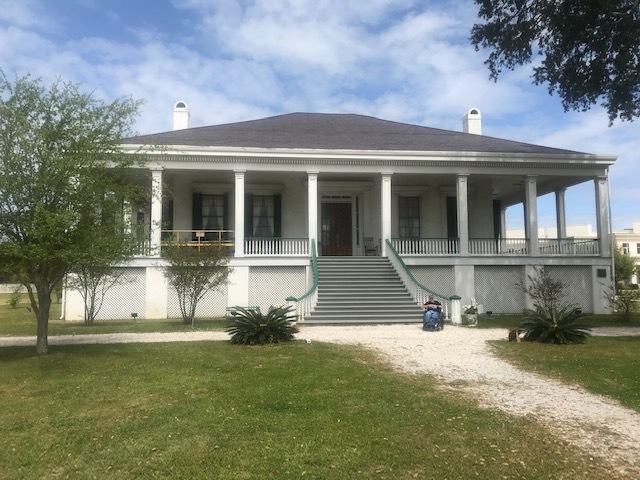 On Friday, March 29, we drove to Natchez, Mississippi, and enjoyed a walk along the riverfront bluffs and some of the historic buildings. We further explored southern cuisine by getting take-out barbecue pork sandwiches and eating them in the park above the river. The river is at near flood stage now and people we met who were on a river cruise said they will need to go part way by bus because the stern-wheeler cannot dock at Memphis due to high water. 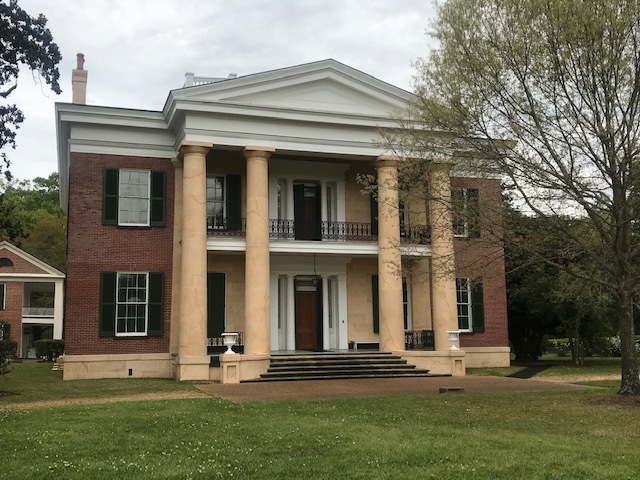 We visited a couple of historic homes (#24) (www.nps.gov/natc) in Natchez, the William Johnson House, built by a “freeman of color,” and the Melrose Estate, and classic antebellum mansion built by a wealthy plantation owner before the civil war. 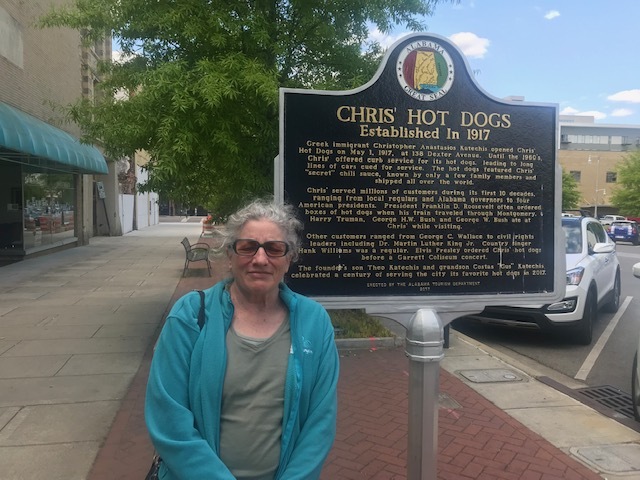 We finished with our brief exploration of Natchez at about 4:00 PM and decided to “put some miles behind us,” so drove another four hours and at 8:00 PM parked our trailer in the dark at a Casino RV park in Bay St. Louis, Mississippi. We had a much shorter day on March 30. We drove along U.S. 90, which hugs the Gulf Coast of Mississippi and Alabama. Our main stop was at the Ohr-O’Keefe Art Museum (#25) (www.georgeohr.org) in Biloxi, Mississippi. It features George Ohr “the Mad Potter of Biloxi,” who produced whimsical and innovative ceramic pottery over a hundred years ago. Cynthia also enjoyed discovering a female artist, Dusti Bongé. We also visited Beauvoir, the residence of Jefferson Davis, Confederate President, and the museum there. 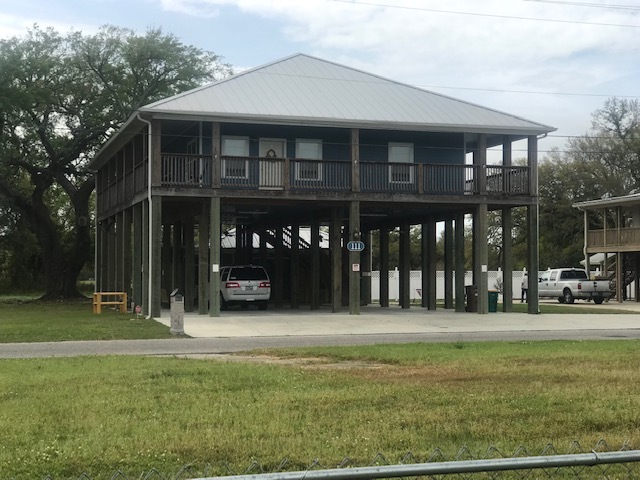 This whole area was badly devastated by Hurricane Katrina, and new houses are built on stilts so they can be protected from the storm surges of future hurricanes. 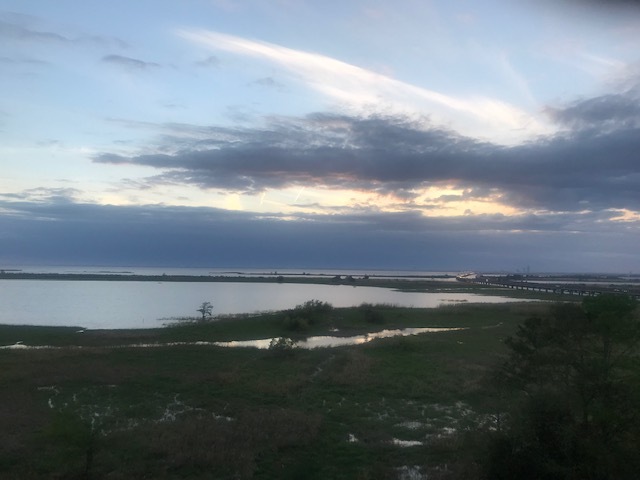 After only 110 miles of driving, and not readily finding available RV camping spaces on a Saturday night, we took a room in a hotel in Daphne, Alabama with a great view of the sunset of Mobile bay. Our first stop after leaving Bentonville was the Pea Ridge National Battlefield (#16) (www.nps.gov/peri) about 30 miles to the Northeast, near Missouri. 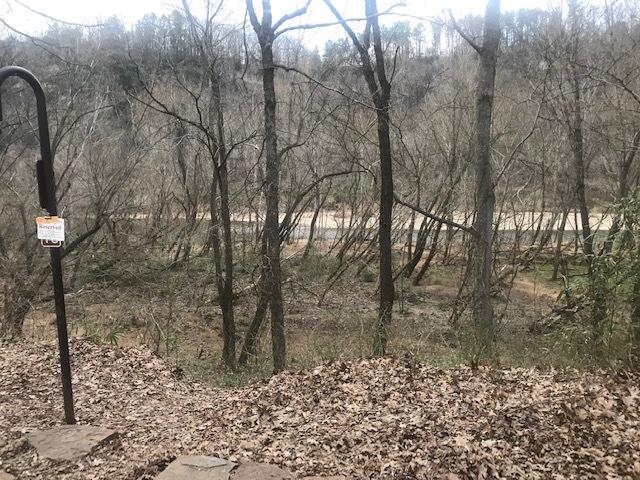 This was the site of a two-day battle between Confederate forces, who were attempting to drive north from Arkansas to capture St. Louis, and Union Forces which were there to stop them. One claim to fame for this battle was “the largest massed bayonet charge” since the Napoleonic wars by the 10,000 Confederates who badly outnumbered the Union forces. And the last, as it was a miserable failure in the face of well-directed artillery fire on the part of the Union Army. 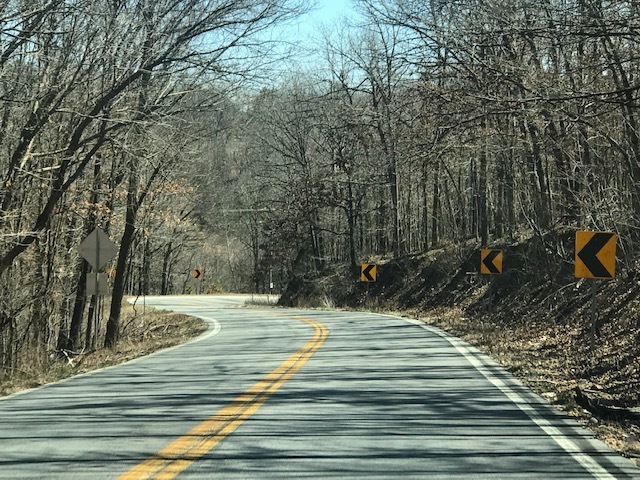 The rest of our day was “up and down, round and round” as we followed a “scenic highway” in the Northern Arkansas Ozarks and made our way to the Buffalo River (#17) (www.nps.gov/buff). 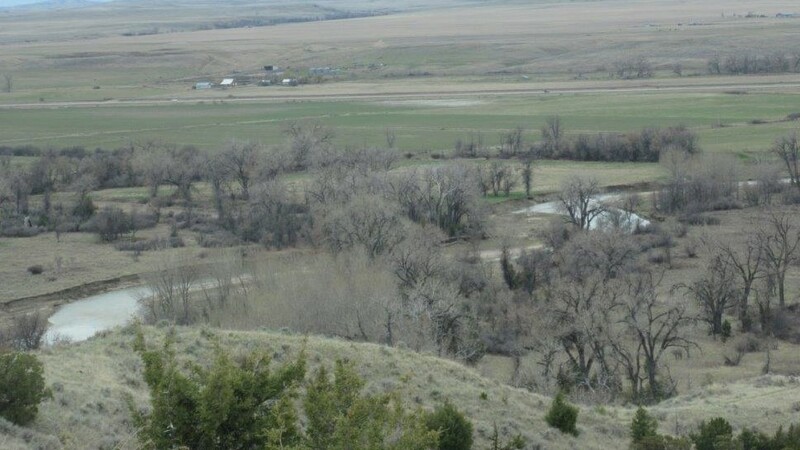 This was the first “National Wild and Scenic” river, so designated in in 1976. 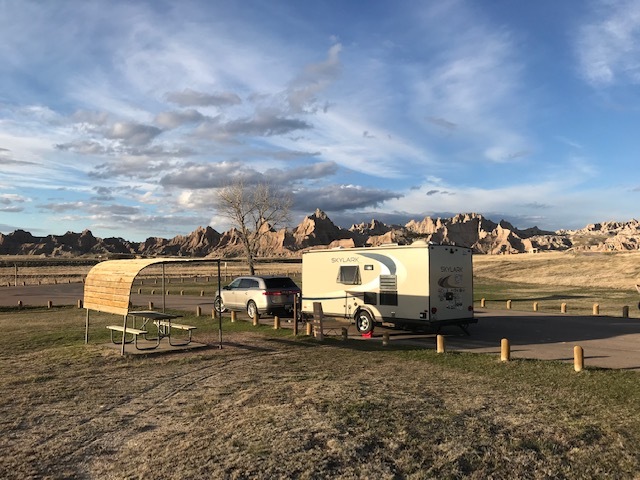 We camped at a National Park service campground at Tyler Bend, accompanied by only two other parties, and the pleasant and serene sounds of the river, doves cooing and the occasional distant sounds of thunder—along with a very dramatic sunset. We continued in a southerly direction on Monday (3/25) and stopped at the Arkansas Capitol, Little Rock for lunch. There, Cynthia and I split up briefly as she went to the Historic Arkansas Museum (#18) (www.historicarkansas.org) to peruse several galleries of local artists, including an impressive section on historic native arts and crafts. 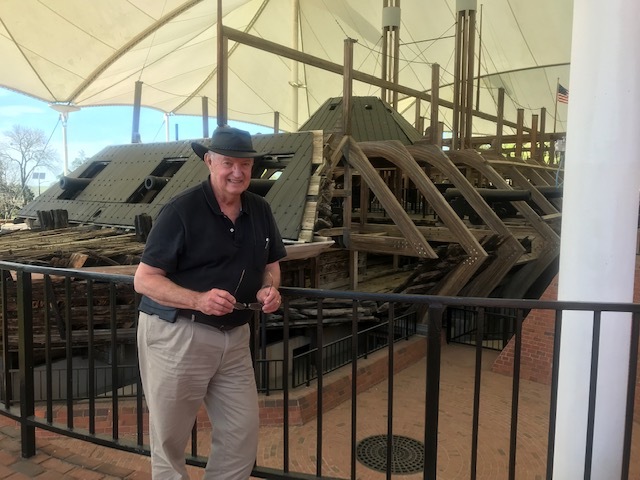 Meanwhile, Larry walked down the Arkansas River to briefly visit the Clinton Presidential Center (#19) (https://www.clintonfoundation.org/clinton-presidential-center), poised above the River, which features a replica of the Oval Office and displays covering the main features of the eight years of Bill Clinton’s presidency. Larry avoided the walk back by taking a nicely refurbished historic trolley to the town center. 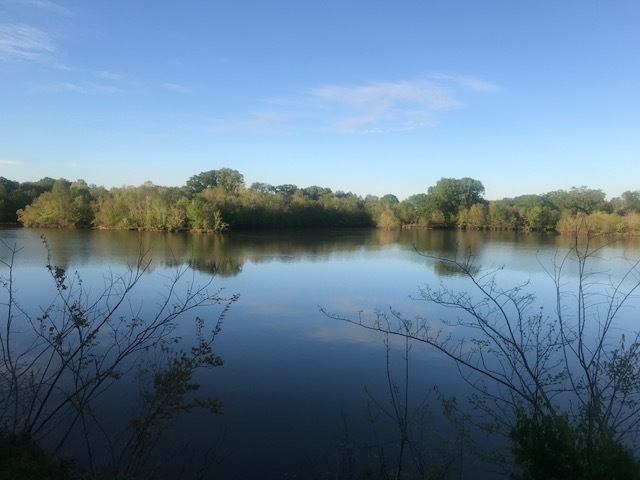 We continued another 75 minutes south in the afternoon and camped at a Corps of Engineers Campground on the banks (literally on the levee) of the Arkansas River a few miles up from where it joins the Mississippi. Once again, we were mostly alone in a peaceful, rural spot—and another dramatic sunset. The next day (3/26) we started out at the nearby Arkansas Post National Memorial (#20) (www.nps.gov/arpo), just north of the Arkansas River. 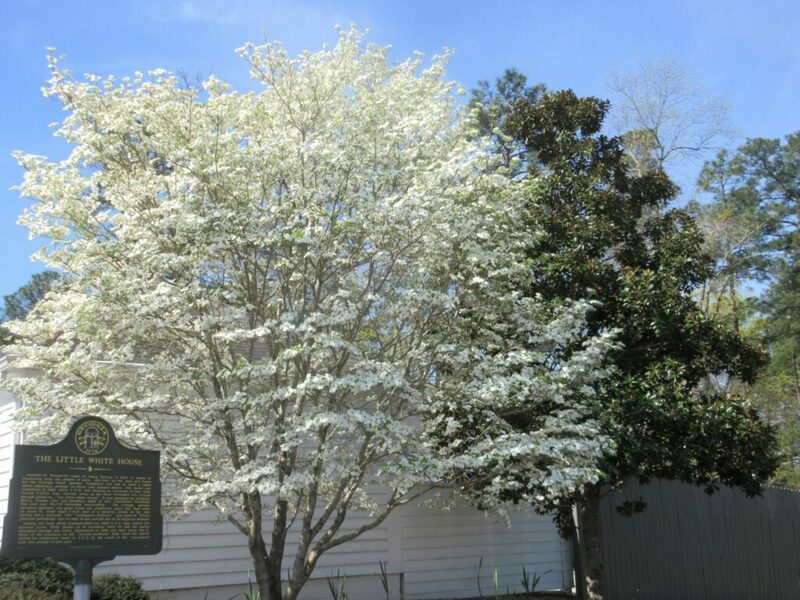 This was the first European settlement in Arkansas and saw a succession of owners, French, Spanish and American. 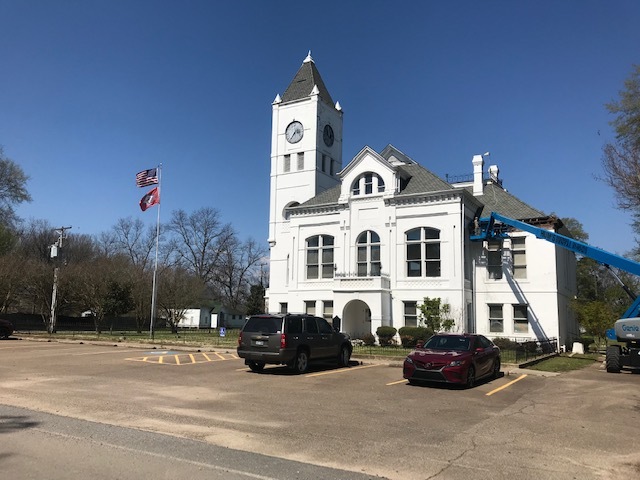 It was the first capital of Arkansas. It was a battle point during the revolutionary war and also the Civil war. We walked the interpretive trail that pointed out past houses, shops and fortifications that are long gone. Proceeding south not far from the Mississippi we stopped in Arkansas City, a former riverfront port town now cut off from the Mississippi by high levees and then in Lake Village, where we attempted unsuccessfully to see a restored plantation. But had some great local cooking and encounters at Rhoda’s Hot Tamale shack (at the recommendation of city folk). 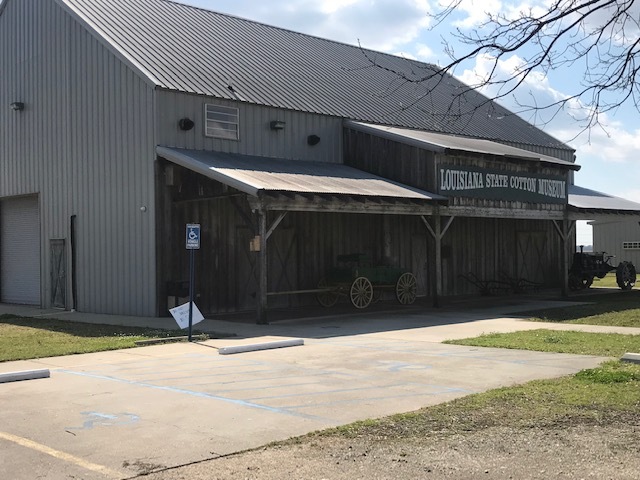 After entering Louisiana we were successful in seeing the Louisiana State Cotton Museum (#21), and were given a guided tour of the cycle of planting, harvesting and processing cotton. 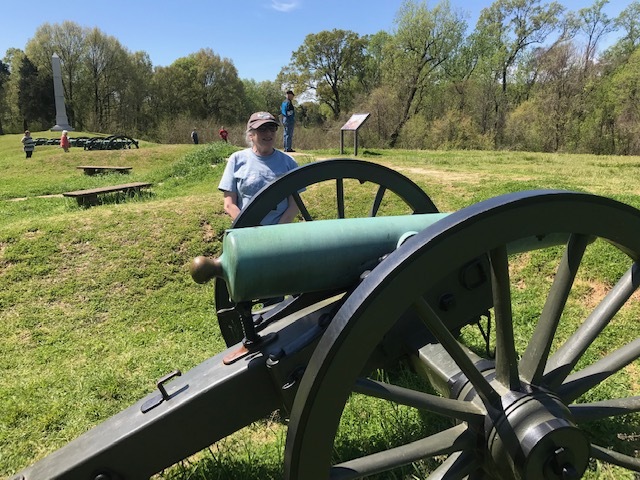 We finished that day by picking out a camping site at the Poverty Point Reservoir State Park, where we arranged to spend three nights. 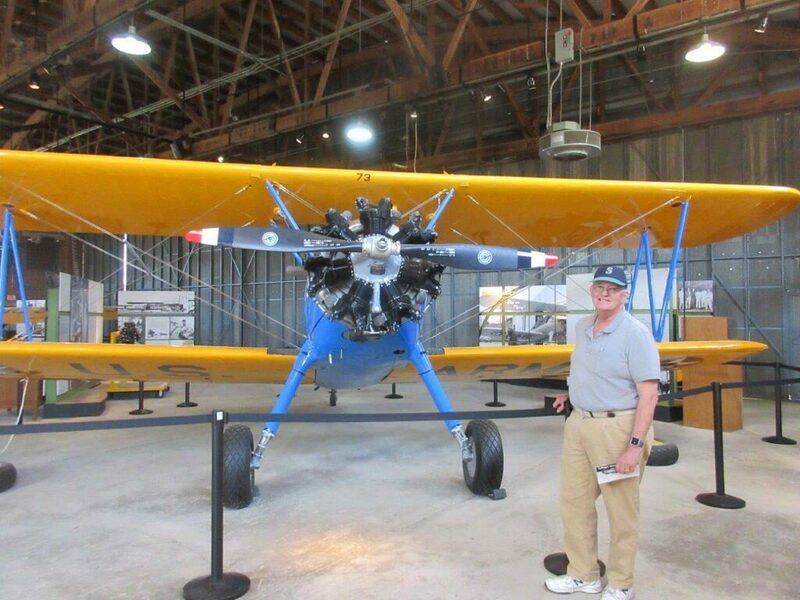 We headed out of Tulsa in a northeasterly direction on Thursday and visited the Will Rodgers Memorial (#11) ( www.willrogers.com/memorial-museum#!) in Claremore, OK. Quite a nice memorial to his life. We didn’t realize that he had such an extensive movie career or a huge collection of saddles. Another nicely done museum. We then proceeded to the Cherokee Heritage Museum (#12) (www.cherokeeheritage.org) at Parkhill. The Cherokees were one of the “civilized” tribes that had adopted many western ways after contact with the British in the early colonial period when they occupied parts of Georgia, Alabama, the Carolinas and Tennessee. 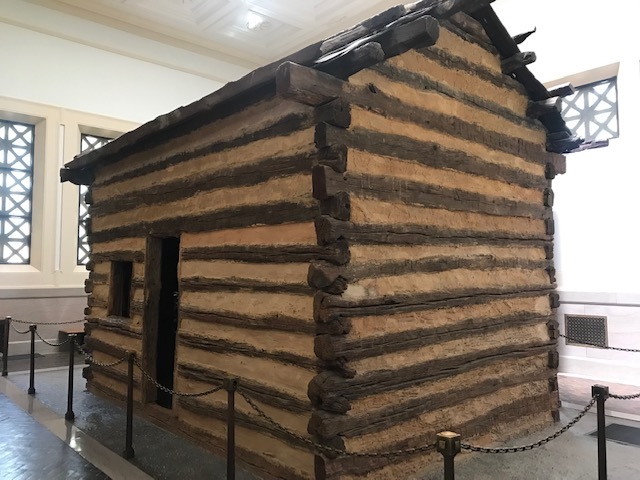 As recounted in this museum, they were then subject to several “removals” finally resulting in the “trail of tears” as they were forced to go to “Indian Territory” in what is now Oklahoma. This was also true for the Choctaws, Seminoles, Chickasaw, and Creek. 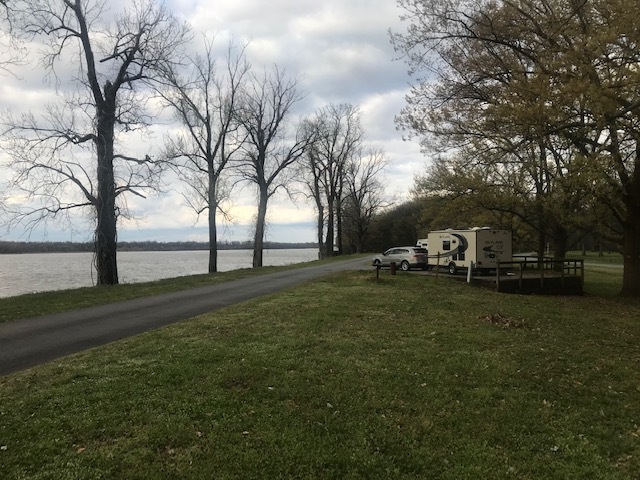 The rest of our day was a pleasant scenic drive south on the Illinois River until we reached our camping spot at Greenleaf State Park next to a lake, still mostly full of families with kids on spring break. 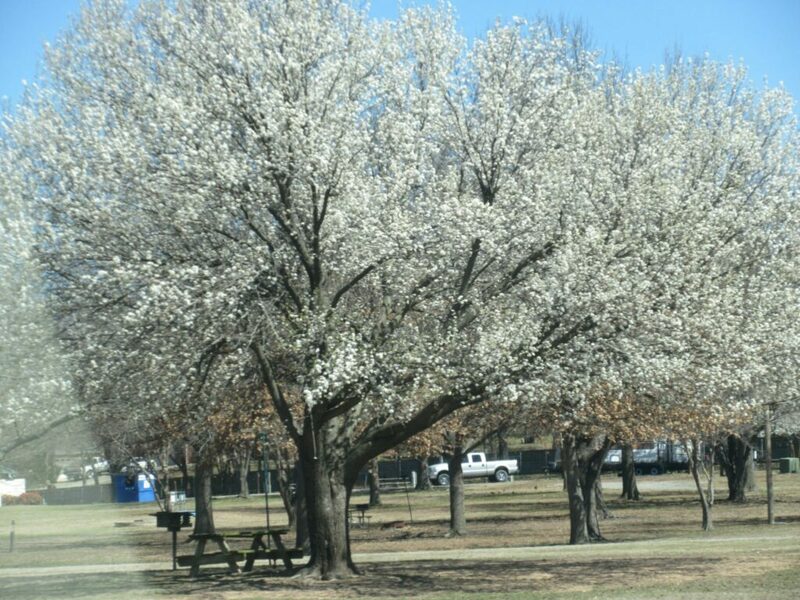 On Friday (March 22) a one-hour drive got us to Fort Smith Arkansas (#13) (https://nps.gov/fosm). 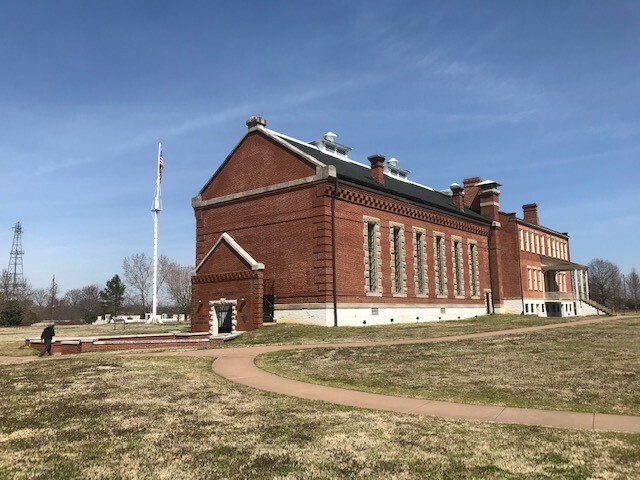 The Fort is a national historic site, as it served multiple roles as a military outpost, a site of conflict during the Civil War and Federal District court with the record of many executions in the late 19th century. From there we proceeded to Fayetteville, home of the University of Arkansas and visited with the parents of one of Larry’s colleagues. 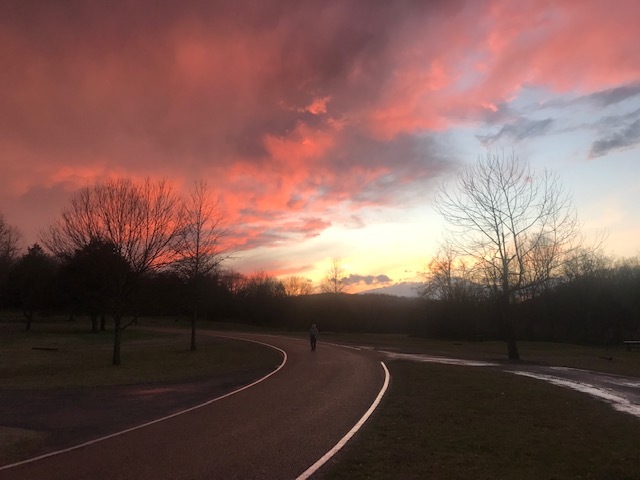 We arrived later that afternoon in Bentonville and had time to visit the grounds of the Crystal Bridges Museum of American Art (#14) (https://crystalbridges.org) at sunset. This museum was funded by the heiress of the founder of Walmart, which is headquartered in Bentonville. With no good campgrounds nearby, we once again abandoned the trailer and stayed in a Holiday Inn for two nights. We started out our Saturday at the Museum of Native American History (#15) (www.monah.us). 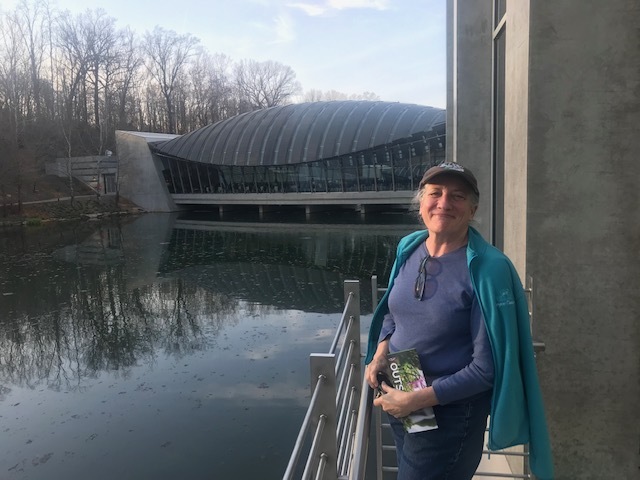 This is a relatively new and small museum in Bentonville, but it did a fabulous job of sketching out the story of the inhabitants of north America from 15,000 years ago to the present. The archeological specimens, especially pottery from the last 1000 years (and mostly from Arkansas), exceed in quality those we had seen earlier in Peru and other collections elsewhere. The remainder of the day we had a chance to fully tour the Crystal Bridges museum. After 10 days of sunshine and blue skies we finally had some rain and a bit of thunder and lightning.